A week today most of you will have a good idea on what party you want to vote for and why you want to vote for them as the polls have opened and you have until 10pm that night to vote. Maybe some of you have no idea at all! For me, I have a great idea of who I’d vote for but unfortunately I can’t as I’m 16. When we decide who we’re going to vote for we consider many different things. Whether we agree with the parties policies (most definitely) , you support the local MP or perhaps you’re vote is tactical. When I think about what party I’d vote for the first thing that comes into my head is what are they planning to do for our natural world. Do they have an action plan? – As this is necessary. Would their plan be effective? Or do they realise how important our natural world is, is this obvious with what they have said and stand for? Everyone has different reasons for voting for different parties, most likely it’s because you agree with something they stand for which affects you. As I said, for me that’s nature. But I think more people need to think about nature when they vote. Not just for those who enjoy it and get great pleasure from it but for themselves. Nature helps everyone in all sorts of ways, for most they don’t even know. From the bees which pollinate the food they eat to the trees which reduce flooding and give us the oxygen we breath. It also helps us in a way that we enjoy being outdoors, whether it be due to illnesses like depression or just for pure enjoyment and escaping. At the end of the day, if you look at the bigger picture, nature affects us all in so many different ways which we all need to understand and consider. If we don’t act now though then our nature is going to carry on declining and they’ll be no going back. Due to this it worries me hugely for future generations. When looking at the manifestos there is a big difference from one to another. Some are very supportive and obviously care greatly about the environment yet others seem to have forgotten that it exists! They also plan to produce a ambitious adaptation programme and prioritise investments in flood prevention. Prohibit developers from being allowed to destroy unique habitats by way of biodiversity offsetting elsewhere. This is just a short list of the policies that the Green party have included in their manifesto about the environment and nature, if you’d like to have a better look, click here. From tomorrow until next Wednesday, the day before the general election, I will do a blog everyday looking at a variety of a few key topics which affects British wildlife and, in some cases, on a world wide scale. Then next Thursday, I will be summarising all that I have wrote about over the 6 day period. In the posts I will go through why it’s important to deal with this issue, who it affects, what will happen if we don’t address the problem, see if there’s been a mention on any party manifesto and much more. With this I hope to help people see some problems we face within the natural world, what parties have said they’ll do to solve this (if anything at all) and be an eye opener. I then plan to share my blog with party leaders and MPs (etc) in the hope they’ll see the problems with these issues and why they need to be dealt with. Another reason why I’ve decided to do this is because nature and the environment has been barely mentioned during general election campaigns. This is quite upsetting, it’s obvious we don’t understand that nature is extremely important. Therefore its important to express the issue in any way we can. Obviously there are many issues which face our wildlife in the UK and world wide but unfortunately I only have six days and because I’m currently extremely busy revising and taking my GCSE exams so I’ve had to focus on them a lot too. Friday – Saving our Oceans. In this blog I’ll be including the massive impact oceans have on all of us, why they need our help and how we can help. Saturday – Snares. In this blog I’ll be including how evil snares are and why they should have been made illegal years ago! Sunday – The badger cull. Where I’ll be including all from the badger march in David Cameron’s constituency, Witney, from the day before. Tuesday – Wild persecution/Wildlife Crime. In this blog I’ll be including a range of subjects, from birds of prey to foxes. Also how we need to stop the persecution through things like the police and the general public (which we bring me nicely onto Wednesdays topic). Hi Georgia. I completely agree – nature has been left out of the election discourse so far. Like you, I’ve been trying to work out what the parties have to say on various environmental and wildlife-related issues – I’ve done posts on climate change, the Hunting Act, the badger cull, and marine protected areas. (Although most of these posts were written before the launch of the manifestos). Sometimes it’s been hard to find out where the parties stand on a specific issue (which is telling in itself). In these cases I’ve written to the parties to ask them, and got some responses, which you might find useful for your posts. I think it’s also important to bear in mind policies the parties have that might be damaging, which may not come in the ‘environment’ bit of their manifestos. For instance, fracking may come under energy rather than the environment, and house building may have an impact on our wild spaces. Good luck with preparing your posts – I look forward to reading them. Thank you. I had a read through your posts, they were very interesting and made a great reading. Also very good point about the policies the parties have that might be damaging to the environment, too. Pingback: GE2015 Day One: Saving our Oceans | Georgia's Wildlife Watch. Pingback: GE2015 Day Two: Snares | Georgia's Wildlife Watch. Excellent post – certainly helped me understand what the different parties are standing (or not standing) for. Thanks! I’m glad I’ve helped you, Jane! 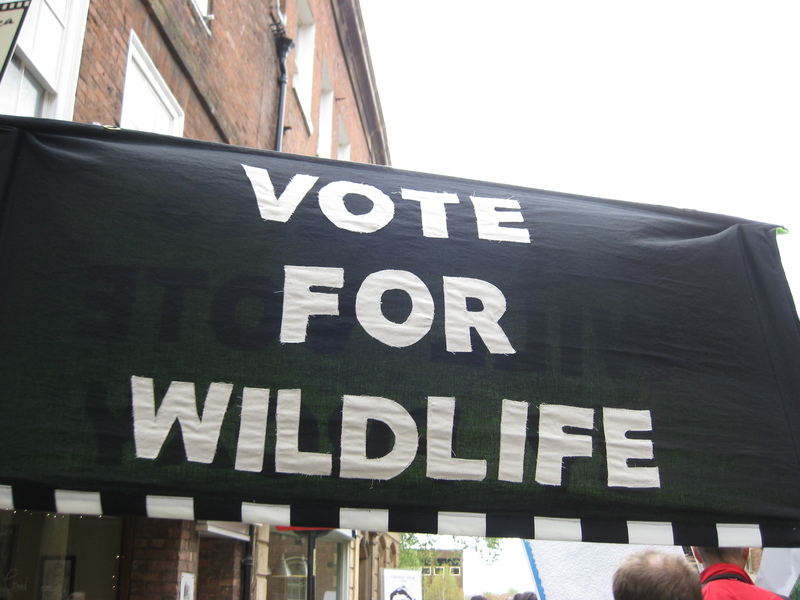 Pingback: GE2015 Day Three: Badgers and Witney March | Georgia's Wildlife Watch. Pingback: GE2015 Day Four: Why We Need To Help Our Bees | Georgia's Wildlife Watch. Pingback: GE2015 Day Five: Wildlife Crime | Georgia's Wildlife Watch. Pingback: GE2015 Day Six: Inspiring The Next Generation | Georgia's Wildlife Watch.